in the Postal History Class. Congratulations to Alan on his achievement. 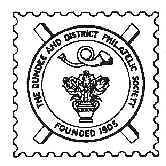 Dundee & District Philatelic Society held its Annual Dinner on Thursday 9th May at which a number of the members and their spouses attended. The dinner was held at the Invercarse Hotel in Dundee, and the evening soon warmed up with good food, drink and great company, and a good night was had by all. Publicity Officer Colin Campbell stepped down during the year and has still to be replaced. At the final display of the season local member George Lewthwaite provided members with a tremendous display of British Postal Stationary which was available to the public from the Queen Victoria to King George VI periods. George began by describing the introduction of the postal stationary in 1837 when John Dickenson invented security paper using silk threads, although following research this was later shown to be cotton and not silk. George displayed Mulready envelope sheets which only lasted about 1 year before Rowland Hill realised that they were not what was required. Also on display were penny pink envelopes, Jubilee 1890 correspondence, stamped to order envelopes and registered envelopes. George finished the first half by showing a Victorian Vaccination Certificate. The second half of the display concerned Postcards with the first postcard being introduced in 1869 in Austria which was then followed immediately by the UK in 1870. George explained that the first postcard contained an error in the Coat of Arms which was corrected quickly, but incomprehensibly the same error appeared in a postcard for Ceylon in 1893. In 1883 inland and foreign reply cards were introduced with the two cards stuck together, eventually this would be replaced by perforations. Also on display were variations in size of card and quality. George finished his display with the introduction of lettercards in 1882 which were to brought in to make the postcards more secure. At the society meeting on thursday night members welcomed Iain Dyce from the Caledonian Philatelic Society who displayed a collection of Postal History from South East Asia during the 19th Century, which he has been putting together over some 60 years or so. Iain gave a fascinating background to how the mail routes in the South East Indies were started once the European countries took over the running of most of the area, covering companies such as the East India Company and the Dutch East India Company up until P&O set up the overland mail routes in 1840 when mail was then transported via Suez. His display consisted of a series of letters which included a letter from Penang to Scotland which included one of the first postmarks of Penang. The letters included commercial ones with one listing the opium prices from Calcutta during the Indo-China wars, and a letter with a quarantine mark. Iain also displayed some letters where Indian stamps had been used for a short period in the Straits Settlements, and then a letter from Bangkok to the USA which used stamps from the Singapore office as it went via Singapore. There was also a letter from Johore to the Isle of Man which had Johore and Straits Settlement stamps which were used to get it posted via Singapore. There was also a scarce cover using a Straits Settlement 8c overprint, which in fact was double overprinted. Iain finished with a series of French Mail C1864 sent between France and Singapore which also included some military mail. First to display from the Postcard Club was Stewart Smith who provided a display of postcards related to transport, all of which were painted by ‘George Sidney Cooper’ who was a transport artist having travelled all over the UK. Stewart’s display consisted of a collection of postcards depicting buses from all over the UK which certainly evoked memories of buses travelled on by many of the members. Many of the buses on display were from locations in England but there were buses from Glasgow and actually one recognisable bus from Dundee. The second half of the display started with Patrick Marks who provided a display of postcards related to St. Andrews during the period of 1897 – 2014. The postcards displayed gave a fascinating insight into the changes St. Andrews has experienced over the years. The postcards were from a variety of publishers such as George Washington Wilson, George Fleming, Valentines and Davidson & Co. Finally Jim Hill provided a display of cigarette cards on a variety of subjects such as the Evolution of the Royal Navy, Steam Ships, British Warships, Footballers and Sporting Personalities as well as Famous Golfers and Musical Celebrities. At the meeting on Thursday night local member Dennis Collins informed members about a book that he has recently had published relating to the area of Craigie of which he has titled 'A Gentleman's Residence'. Dennis advised members that the book will be available for sale at certain outlets in Dundee as well as from himself and that 30% of the proceeds will be donated directly to society funds. Thursday nights' meeting saw a display of 'Jamaica' from Colin Caskie (a member of Perth Philatelic Society), who is also an ex member of our local society. Colin displayed stamps, covers and postcards from Jamaica but his display different from the usual format in that he displayed the stamps in stamp value sequence instead of in chronological order. The display began with Queen Victoria stamps and included those with Pineapple Tilt and Crown watermarks, as well as stamps which were issued 10 years after her death, which is very unusual. The display continued with the shield stamps of King Edward VII's reign as well as specimens of the 1905 issue. It also included war tax issues, colour varieties and imperforate plate proofs. Of great delight to philatelists at the time was an issue where it was discovered that the Union Jack was printed upside down. The display then continued on to King Geeorge V and the 'Bow' varieties, followed by the pictorial issues and the Silver Jubilee issue which also included the extra flagstaff error. This was followed by King George VI small heads issues. Colin finished off his display with covers (showing handstamp) from the 3 routes covered by the Travelling Post Offices and a set of postcards related to Jamaica. The meeting on 12th February was a members night based on a theme using the letter 'L'. George Souter: Longevity – Centenary stamps. A fascinating range of stamp issued for people and events (notably some for his favourite subject, sport). David Easson: Ugandan post-offices beginning with L - 12 of the 15 were presented. Harry Jackson: Luftpost (Germany) airships and planes from 1912 to the 1930s; A special cover – Belin to Lugano using pneumatic post, Luftpost & special delivery. David Dobson: Latvia. Stamps from 1920s paper shortage period printed on the reverse of German WW1 maps and Bolshevik banknotes. Ron Goodfellow: Postcards with 20th century Scottish handstamp cancellations for post offices beginning with L Dennis Collins: The hotel stationery of Lucerne. Thursday nights' meeting saw a display from local member Alec Steele who has been a collector of Early Rhodesian stamps for a significant number of years. Alec's display has to be one of the foremost collections of British South Africa Company and Early Rhodesia in existence. The first part of the display concerned the Arms and Double Heads Issues finishing with the beginnings of the Admiral issue. On display were a number of stamps, some of which are scarce and very difficult to find, with overprints, specimens and a significant number of varieties in colour. Also included in the display were blocks of stamps and some with inverted overprints. Varieties in perforation were also displayed as well as different types of flaws in the double head stamps. Part of the display also had a block of 8 stamps which contained 2 different types of flaw. Alec finished the first part of his display with the beginning of the Admiral issue. The second part of the display continued with the admiral issue which included different Dies, Livingston overprints and inverted overprints. Also shown was a variety of 2/- stamp in yellow brown which is extremely difficult to find, with possibly only 1 sheet of this variety produced. Alec then continued the display with some postal stationery from 1893, including a postcard from Cape of Good Hope overprinted with Rhodesia, which was used when postcards ran out. This was followed with some postal history of 1896 and some more modern day letters, a number of the early ones which related to the Matabele Rebellion. The first meeting of 2015 was the Annual Competition on 8th January at which members competed in four competitions for the Thematic Shield, the Postal History Shield, the National & General Shield and for the prize of winning Social History which unfortunately does not have a Shield to be presented for it. In the Thematic Shield there was only one entry by Charles Lloyd with a display of Heroes or Villains (People featured on the Stamps of Rhodesia and Zimbabwe). In the Postal History Shield there were two entries Singapore - incoming Postal Stationery, and, The Surcharging of Rhodesian Mail which won the Shield for Charles Lloyd. In the National & General Shield the entries were 'Horizon Labels since their introduction' and 'Three small Indian States (Barwani, Morvi and Idar)' and 'The Seebeck Issues (of Nicaragua, El Salvador and Ecuador)'. The winner of the Shield was Harry Jackson with 'Three small Indian States (Barwani, Morvi and Idar)'. The Social History competition had two entries 'Tintin au Congo' and 'The Union Castle Line'. The winner of the Social History section was Peter Dix with his entry of 'The Union Castle Line'. This latest meeting on 11th December was the One-Sheet competition for members and a chance to show off their latest acquisitions. 10 members submitted a superb variety of entries for the competition. The winner of the competition was Harry Jackson with his display of a letter to Stuttgart showing the Currency Reform in place at the time with a mixture of stamps from both East and West Germany. In the second part of the meeting 11 members displayed their latest acquisitions for the other members to peruse. Some of the displays covered stamps and covers from a variety of countries such as Sierra Leone, Congo, Madeira, Uganda, Netherlands Antilles, Canada, Jersey, New Zealand and Nova Scotia. Also displayed was postal stationery from hotels in Geneva and parcel post labels from various post offices in Dundee. Last nights' meeting saw a display from James Podger FRPSL, brother of our President Francis Podger FRPSL. The title of James' display was 'Africa & adjoining Oceans' but as we were to find out the display was more concentrated on Ascension Island, St Helena and areas of the West African Coast. James provided members with a most fascinating series of tales about his life whilst working on Ascension Island and displayed letters, postcards and various ephemera collected during his time there and whilst also visiting St Helena and other ports around West Africa. Whilst on Acension Island James carried out some important philatelic duties, he painted both of the island's post boxes to become the red colour we are accustomed to instead of the green colour they were before, and also inventoried all the philatelic archive material on the island. James also regaled members with stories of how the runway on Ascension Island was extended to cater for the Space Shuttle should it need to land there as well as how the island is used as a main GPS monitoring station. He also told us how his ship managed to lose an anchor and chains which was a major concern to him as Captain. As part of the display James also showed off stamps from the reign of King Edward VII from Gambia and the Seychelles which contained 'The Glover Flaw' and 'The Slotted Frame' flaws. Last nights' meeting saw a number of members display items relating to 'The Great War'. Visitor Christopher Podger FRPSL started off the proceedings by displaying letters and postcards relating to events in Cyprus including censored mail from a POW camp and a 48 hour pass. Robert Duguid then followed on with a story of Captain Fryatt (a british mariner) who was executed by the germans for attempting to sink a u-boat. Peter Dix then displayed stamps from Bosnia and Tristan da Cunha celebrating the End of WWI with paintings by War artists. Peter also displayed stamps from South West Africa depicting the Kaizers yacht along with postcards of hospital ships. This was followed by Sandy Sloss displaying postacrds relating to the Macedonian front and gave a detailed picture of the events which took place during the attacks on Thessaloniki. Finishing off the first part of the night Harry Jackson displayed postcards sent by military personnel from the Western, Eastern Balkan fronts and from Naval Warfare. Harry showed his very detailed knowledge of the subject in describing the events relating to the postcards. In part 2 of the night Chad Neighbour started off by showing some postcards including the victory parade in Paris. Charles Lloyd ended the evening by displaying stamps from Portuguese East Africa and the Nyasa Field Force frollowewd by postacrds sent from the Belgian Congo sent to Belgium and France some with feldpost marks and including some postacrds which were sent and arrived a year later due to the war commencing the day after the letter was sent. Charles also brought out examples of Hard Tack and Cake which would have been sent to soldiers during the war. To round off the evening members then tucked into the Hard Tack and Cake. Thursday Nights' meeting of the society saw four members of Lanarkshire P.S. visit and provide members with a set of displays on entirely different themes. The first pasrt of the evening consisted of displays from Robert Bradford and Mike Cleary. Robert Bradford kicked off the first part of the evening with a display on ‘Cilicia’. Robert provided an excellent outline of how the area of Cilicia was formed following WWI up until it became part of Turkey in 1921. Robert’s display showed the use of Turkish and Syrian stamps which were overprinted Cilicia. This was followed by Mike Cleary who finished the first part of the display with a display of stamps and covers celebrating personalities involved in Medicine, featuring people such as Louis Pasteur, Robert Koch, Marie Curie and Alexander Fleming. The second half of the display started with Eric Ross giving members a display of ‘Mountains of the world and the leisure activities they support’. As part of the display Eric has stamps to show the highest mountain in each of the seven continents. Bringing an entertaining night to its conclusion Brian Dow presented a display featuring the explorer Roald Amundsen. Brian’s entertaining display has a mix of stamps and covers from various countries including stamps from ‘Djibouti’ and listed some of the different explorations carried out by Amundsen. The display also included a letter sent to the King of Norway on reaching the South Pole ahead of Robert Falcon Scott. Thursday Nights' meeting of the society saw newly installed President Francis Podger FRPSL provide members with a display of 'Singapore Incoming Postal Stationery'. As the title implies the display featured postal stationery from countries around the world which had been sent to Singapore. All correspondence on show was pre independence therefore prior to 1965. Francis highlighted the fact that the mail from India was mainly from Southern India and that it was usually posted underpaid to ensure that it was actually delivered. The underpaid mail highlighted by the postage due stamps affixed to them. Some of the correspondence showed the text inside the envelope and in one particular case a letter from the Dutch East Indies contained a reply part which had actually been returned. Another letter was from the Director of the Royal Botanical Gardens in St Petersburg, Russia to the Director of the Royal Botanical Gardens in Singapore acknowledging receipt of samples of seeds. Last night's meeting was the first of the new season and in a change to the published syllabus as a result of President Francis Podger being unavailable local member Doug Howkins provided a display of Latin America. The 19 members who attended were treated to a wonderful display of stamps from 21 different countries which make up Latin America. In the first part of the display Doug covered those countries in Central America, Ultramar and The Spanish Main. and displayed a variety of stamps covering periods from the 1800's to the 1930's and in which he displayed superb knowledge of the subject. In the second half of the display Doug's display covered the remaining areas of Latin America, namely The Andean Lands, Pampas, Chaco and Forest. Again the display covered stamps and postcards from these areas and to the members delight Doug again showed his knowledge in these areas.